There are more than 140 varieties of plum sold in the United States. The plum is a drupe—a pitted fruit—related to the nectarine, peach, and apricot, but it is far more diverse than its relatives, coming in a wider range of shapes, sizes and especially skin colors. Its flavors also vary from extremely sweet to quite tart. Some plum varieties are specifically bred so that they can be dried and still retain their sweetness, and these are used for prunes. About twenty varieties dominate the commercial supply of plums and most are either Japanese or European varieties. Japanese are the nonprune plums or salicina plums. Originally from China, these plums were introduced into Japan more than 300 years ago. Most varieties have yellow or reddish flesh that is quite juicy and skin colors that range from crimson to black-red. They are also clingstone fruits—that is, their flesh clings to the pit. Plums are also used for their juice and often jam or a thick syrup is made out of it. European-type plums are smaller, denser and less juicy than Japanese varieties; their skin color is always blue or purple and their pits are usually freestone, meaning they separate easily from the flesh. The flesh is a golden yellow color. These are the plums made into prunes; a few varieties are sold fresh and called fresh prunes or purple plums. 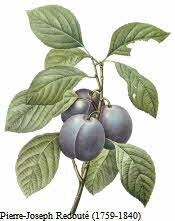 Damson plums are a small-tart European-type variety used mainly for preserves. Plums can be divided into 2 distinctively different groups that are known as Japanese plums and European plums. European varieties all have yellow to green/amber flesh and purple or blue skin. Japanese plums come in a wide range of colors from gold to blood red, but never the blue/purple skin color. Most also have yellow flesh, but some have red flesh. The names of some of the red fleshed varieties you should look for are Frontier, Mariposa, Laroda, El Dorado, Carol Harris, Ace, Duarte and Elephant Heart. Plums stimulate the bowel movement. Its skin contains a substance that is responsible for that effect so if you peel the fruit you won't be bothered with the well-known side effects of this lovely fruit.